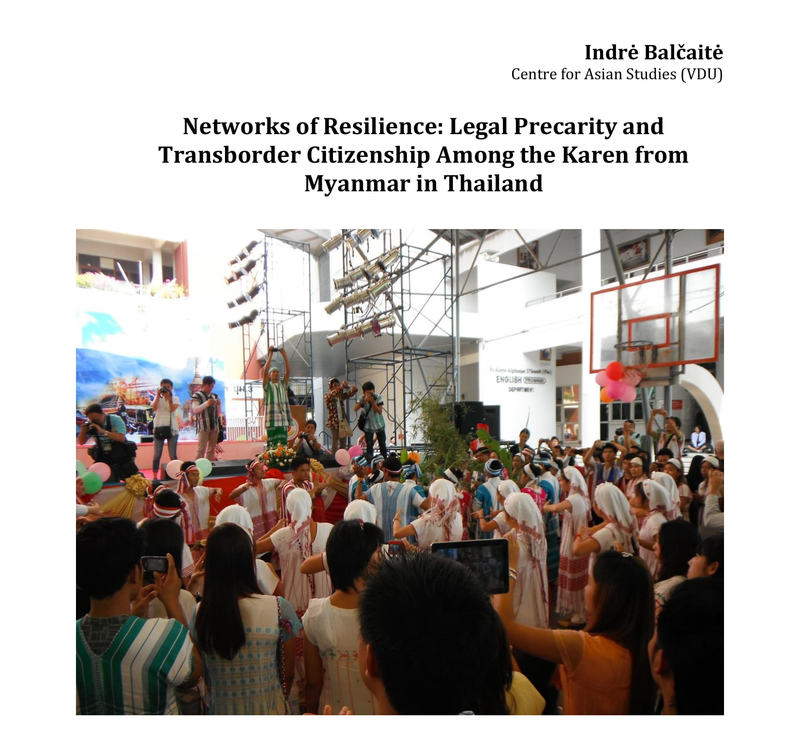 Vytautas Magnus University Centre for Social Anthropology invites you to the seminar “Networks of Resilience: Legal Precarity and Transborder Citizenship Among the Karen from Myanmar in Thailand”. Speaker of the seminar – Indrė Balčaitė. The seminar will be taking place on April 12th, 2018 at room 103 in Gediminas st. 44, Kaunas. The paper probes the relationship between legal precarity and transborder citizenship through the case of the Karen from Myanmar (Burma) in Thailand. Collected during ethnographic fieldwork between 2012 and 2016, interconnected individual life stories evolving across the Myanmar-Thailand border allow us to critically interrogate the political and legal categories of ‘migrancy’, ‘refugeeness’ and ‘citizenship’. In migrants’ experience, these notions blur into each other. The study demonstrates that legal precarity is not simply an antithesis to citizenship. Following Audrey Macklin’s (2007) critical legal anthropology, the paper will suggest a theoretical framework to reconcile the legal precarity of the Karen in Thailand (even de facto statelessness) and citizenship, even on both sides of the border – legally impossible but quite popular in the Myanmar-Thailand borderland. Although the legal situation of the three Karen groups in Thailand differs but a grassroots approach reveals that the Thai Karen, Karen refugees and economic migrants from Myanmar overlap and intertwine. The Karen social networks help them to achieve a degree of resilience and to improve their legal status over time, even by attaining citizenship despite its strict legal regulation. The presenter: Having graduated from Vilnius University in political science, Indrė Balčaitė did an MA in political theory at the University of Nottingham (UK). In 2016, she completed a PhD at SOAS University of London (previously known as School of Oriental and African Studies) based on an ethnographic study in migration and transnationalism of the Karen ethnic minority in Thailand and Myanmar (Burma). Later she taught and continued her research at Central European University. In Lithuania, Indrė has mostly worked in the field of public administration and policy analysis. She is currently an associated member of the Centre for Asian Studies at Vytautas Magnus University. Language of the seminar: English.